The showroom is open by appointment, normally from 11 a.m. to 6.00 p.m. Monday to Saturday; but because I am working alone it is important to telephone first to make sure I will be here: (Phone 023-8847843 & 087-2401738)	Phone	me	also if you get lost: I'll talk you through it! I can also be open later in the evenings or on Sundays by arrangement. 1. In the centre of Bandon, turn right when you are facing the Methodist Church and go over the bridge. Turn left at the old Post Office and follow the main road to Dunmanway. (You will pass the old workshop at Lauragh on your left). About 7 miles (11 km) from Bandon you come to a place called Murragh. (Big signpost and 50 kmph sign). You will see Palace Anne Mill, which has been converted into apartments, on your right. 2. Take the first left turning after the mill. Follow the road (less than 1 mile) over the bridge to the first cross roads. There's a pink house facing you at this cross, and a signpost pointing right for Bandon Pottery. 3. Turn right. You pass two farm houses and some new houses, then on your left you will see a long bungalow with a with a big hedge and balustrade, Glenview Gardens, a wishing well and other fancy ornaments in the garden, and concrete garden products for sale. 4. Soon after this you come to a "Y" fork in the road. The main road goes right to Enniskeane, but you must take the left, narrow, road which goes uphill. You will pass a cottage and a new house on the left, then you come to a farm on the right. 5. Immediately after the farmyard, and before the next farm, there is a narrow lane on the right, with curved entrance walls painted yellowish. Turn right here. My house is the second house on the right, with a gravelled parking area in front of the gate. The Bandon Pottery van is normally also parked here. You will find the showroom and studio at the back of the house. 1. At the cross roads in the centre of Enniskeane, turn right, taking the road to Clonakilty. You will pass a big sawmill with huge piles of timber, then go over the bridge and a short distance uphill. 2. Take the first turning on the left after the sawmill. Follow this road for nearly 2 miles to a "Y" junction. Take the turning to the right, going uphill. If you pass Glenview Gardens on the right you have gone too far and missed the turning! 3. You will pass a cottage and a new house on the left, then you come to a farm on the right. 4. Immediately after the first farmyard, and before the next farm, there is a narrow lane on the right, with curved entrance walls, painted yellowish. Turn right here. My house is the second house on the right, with a gravelled parking area in front of the gate. The Bandon Pottery van is normally also parked here. You will find the showroom and studio at the back of the house. 1. At the roundabout at the East end of Clonakilty, take the road to Bandon. Follow this road for about 5 miles. Go through Ballinascarthy (pass the Ford car sculpture on your right). 2. Take the second turn on the left after you leave Ballinascarthy. It is signposted to Enniskeane and is very soon after the first left turn which goes to a guest house. 3. Follow this road for about 4 miles until you come to a cross roads (Desert Cross). Don't take any of the turnings to Ahiohill! 4. At Desert Cross there's a pink house on your left, and a signpost to BANDON POTTERY. Turn left here. You pass two farm houses and some new houses, then on your left you will see Glenview Gardens, a long bungalow with a big hedge, and concrete garden products for sale. 5. Soon after this you come to a "Y" fork in the road. The main road goes right to Enniskeane, but you must take the left, narrow road which goes uphill. You will pass a cottage on the left, then you come to a farm on the right.You will pass a cottage and a new house on the left, then you come to a farm on the right. 6. Immediately after the first farmyard, and before the next farm, there is a narrow lane on the right, with curved entrance walls, painted yellowish. Turn right here. My house is the second house on the right, with a gravelled parking area in front of the gate. 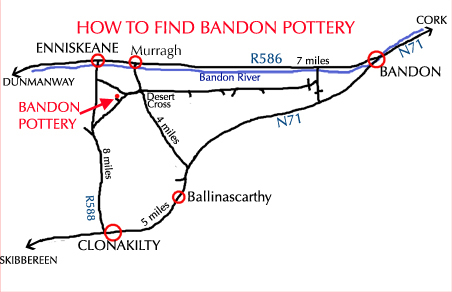 The Bandon Pottery van is normally also parked here. You will find the showroom and studio at the back of the house. 1. Take the road to Clonakilty. Just before you get to Clonakilty you will see the Clonakilty by-pass on the right and the new Dunnes Stores on the left. 2. Take the first left turn after this, to Enniskeane. (There's an Oil Depot on the corner). 3. Follow this road for about 8 miles, past Fernhill House, through Lyre etc. Look out for a big new greyish-white detached house on the left, set back from the road, with big wrought-iron gates. Just after this you will see a ruined barn on the right built at a skewed angle to the road, next to a newer farmhouse. Just after this there's a turning on the left signed to Dunmanway or Ballineen. Go only a few yards past this turning and you will see a narrow unsignposted road to the right. 4. Turn right here, and follow this road down for about 2 miles, past a few farms and new houses on both sides, until you see a farm on the left with a prominent conical feed silo, painted dark green. Immediately after the silo, there is a narrow lane on the left, with curved entrance walls painted yellowish. Turn left here. My house is the second house on the right, with a Bandon Pottery sign and a gravelled parking area in front of the gate. You will find the showroom and studio at the back of the house. 5. If you miss the turning at 4 above, don't worry! Just keep going till you get to Enniskeane, then turn round and follow the directions given above for coming from Enniskeane.